On the afternoon of March 27, 1904, Sir Arthur Conan Doyle was driving home from a day of playing golf with his brother, Innes, when he turned too quickly into his driveway and clipped a gatepost. The collision sent the car careening up a grassy bank inside the gate and it flipped over, trapping both him and his brother underneath. Luckily, the steering wheel kept the chassis high enough off the ground to allow Innes to scramble free, but before Arthur had a chance to escape, the wheel buckled and the full weight of the car suddenly pinned him face-first to the ground. …the weight of the car settled across my spine just below the neck, pinning my face down on the gravel, and pressing with such terrific force as to make it impossible to utter a sound. I felt the weight getting heavier moment by moment, and wondered how long my vertebrae could stand it. However, they did so long enough to enable a crowd to collect, and the car to be levered off me. I should think there are few who can say that they have held up a ton weight across their spine and lived unparalyzed to talk about it. It is an acrobatic feat which I have no desire to repeat. Amazingly, both men were left with nothing more than a few bruises. When news of the incident broke in the press a few days later, Doyle was soon being asked to account for his miraculous escape from what would ordinarily have been a fatal accident. He was a keen sportsman, and certainly physically very fit—Doyle played soccer and was a proficient skier, and played on the same cricket team as Peter Pan author J.M. 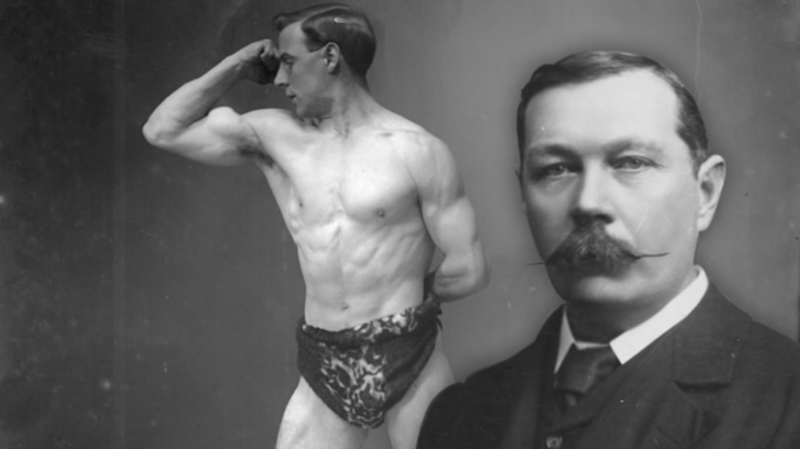 Barrie—but above all else, his attributed his escape to a muscle-conditioning program he had undertaken several years earlier with the help of a world-renowned German bodybuilder named Eugen Sandow. Before long, he had earned a sizeable fortune, which he took back with him to Europe and invested in an “institute of physical culture”—essentially, a 19th century gym—that he opened on St. James’s Street in London in 1894. And it was there that he first attracted the attention of Arthur Conan Doyle. By now, Doyle was a well-established and successful writer. The first Sherlock Holmes novel, A Study In Scarlet, had been published almost a decade earlier, and Doyle had followed it with a second novel, The Sign of Four, and two dozen short stories. Despite his literary success, however, Doyle continued (as he always had done) supplementing his writing with his day-to-day work as a doctor, and in 1890, he had opened a private medical practice in central London—barely a 20 minute walk from Sandow’s institute. Doyle’s training in medicine and anatomy, as well as his own personal interest in sport, led him to become one of Sandow’s earliest and most significant clients, and over the years that followed he meticulously followed Sandow’s exercise regime—so that by the time of his car accident in 1904, he was in exceptional physical shape. Sandow’s training, it seemed, had quite literally saved his life. The Albert Hall was crowded. There were eighty competitors, each of whom had to stand on a pedestal, arrayed only in a leopard’s skin. Lawes and I put them up ten at a time, chose one here and one there, and so gradually reduced the number until we only had six left. Then it became excessively difficult, for they were all perfectly developed athletes. Finally the matter was simplified by three extra prizes, and then we got down to the three winners, but had still to name their order, which was all-important since the value of the three prizes was so very different. The three men were all wonderful specimens, but one was a little clumsy and another a little short, so we gave the valuable gold statue to the middle one, whose name was Murray, and who came from Lancashire. The competition was a huge success, and at a lavish champagne banquet afterwards Doyle and Sandow were able to meet and congratulate the competitors in person—although Doyle eventually went one step further. When the party was over, Doyle left the Hall to go find a cab to take him back to his hotel, but outside he saw the winning strongman, Mr. Murray, walking away, still carrying his enormous golden statuette under his arm. Doyle ran after him, and asked where he was going. He asked my advice as to selling it, for it was of considerable value and seemed a white elephant to a poor man. I told him he should open a gymnasium in his native town, and have the statue exhibited as an advertisement. This he did, and I believe he has been very successful.